A website design and infographics suite that visually explain the community benefits from clean energy investments. San José Clean Energy, or SJCE, is the City of San José’s new electricity supplier—charting the city's path to a greener future. SJCE’s carbon-free energy is like taking 44,000 cars off the road. Topics like energy and infrastructure can be confusing to those not steeped in the industry. The project required a website design and infographics that would resonate with the community and explain how sourcing and building cleaner energy results in benefits to everyone. 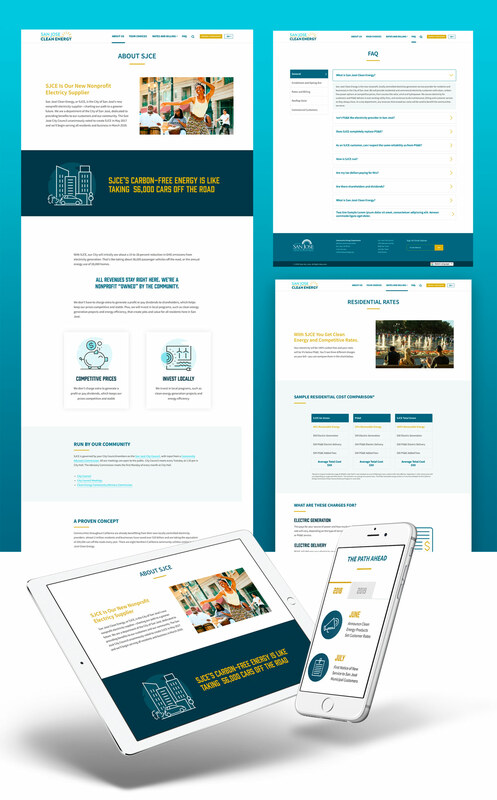 San José Clean Energy, consulting firm MIG, Inc, and Urban Insight collaborated to create an engaging, mobile-optimized website design and series of infographics that visually communicate SJCE’s value proposition and benefit to the community.